Clipping Chix: Sonic: Grilled Cheese Sandwiches only 50¢ ALL Day Long 12/30/15! Sonic: Grilled Cheese Sandwiches only 50¢ ALL Day Long 12/30/15! Looking for an inexpensive meal out? If you have a Sonic near you, mark your calendar! 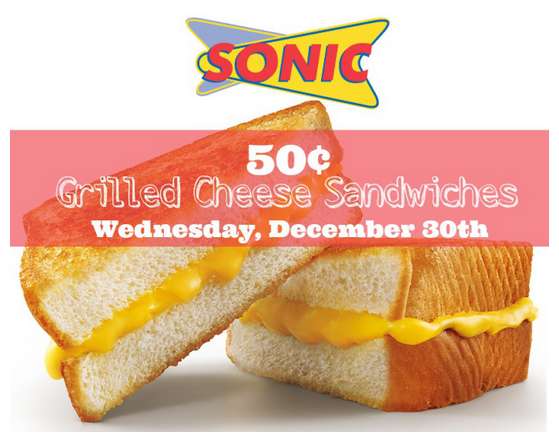 Wednesday, December 30th, participating Sonic locations will be offering up Grilled Cheese Sandwiches for only 50¢ each all day! Head here to find a location near you. I would suggest you call ahead to make sure your Sonic is participating. iTunes: Download The LEGO Movie for only $4.99! Philadelphia Cream Cheese $1/2 Printable Coupon! Google Play: FREE Holiday Music Download! Staples: Cupcake Dessert Stands as low as $8.99! CVS: Got2B Stylers only $1.99 with Coupon! CVS: McCafe K-Kups only $5.99 with Coupon! Rite Aid: $5 off $25 Beauty Purchase Coupon!